Read this before you 'spoil the ballot' or don't vote. Image from The Guardian. Counting votes in a UK election. All votes are counted, recorded and announced for each constituency. Like all democratic votes, protest votes will only be included in news reports and national results when the numbers make them significant and newsworthy. In the 2015 General Election, the UK total of 'rejected' or 'spoilt' votes was almost 100k. (97,870 to be exact.) That is a huge number. It's equivalent to the votes for 3 or 4 MPs, given that most MPs are elected on 18k to 28k votes. But across the country, it represents less than 1% of votes. So it was not news. Meanwhile, 34% of registered voters (nearly 16 million!) just didn't vote. Goal: If just some of those non-voters will Vote for what they believe in, the results of the election can change. See the Real Results. Goal: If just some Vote NONE, then the protest for change can be the biggest ever public protest in UK history. It can establish the protest vote as part of UK politics. Why Vote NONE? Protest votes must be clear. To make a protest visible, don't just 'spoil the ballot'. At present, UK elections are like a referendum where you can only say 'yes' to what is on offer. That will continue until enough voters clearly say 'no'. There have been petitions asking for 'None of the Above' (NOTA) on the ballot paper for many years. However, like the demand for votes for women in the early 20th century, success doesn't come just from asking. Voters have to make it happen. We already have the vote. It just requires some of the Unheard Third to vote NONE in protest, instead of being silent. Image from The Guardian. Counting votes at a UK election. Your protest vote will be rejected as a vote for a candi­date. To be a visible protest, you then want it to be classified as a protest vote. If the rejections multiply, just the huge number will be newsworthy. But classification is important. Protest needs to be recognised and heard as protest, not dismissed as voters' mistakes or 'spoilt ballots'. - unmarked or void for uncertainty. The examples given include a protest vote (below) where the voter has written 'None of the Above' with a tick. The advice is to classify it as 'voter's intention uncertain'. We can all accept that elections are about selecting candidates. And of course a protest vote must be rejected as a vote for a candidate. But by mixing protest votes with mistakes and unclear or 'spoilt' ballots, this classification is used to silence UK democratic protest. Like absentions in meetings and in parliament, protest votes should be counted separately. It is indefensible not to recog­nise that there are political views beyond what is being offered by the parties. If enough people vote NONE, it will become indefensible in practice. The weakness in their classification is that the 'voter's intent' in the example is clear. No sane person could fail to under­stand it, especially in the current political environment. However, it is technically not clear beyond dispute. There is a tick in a candidate box, which can be accepted as a vote in place of a cross. So only the scribbled words show it's not a vote for the candidate. 2. the number of protest votes must multiply. - Don't put a cross (or tick) anywhere. - Don't write anything else which could identify you, or create any uncertainty or excuse. - Just put a single line through all the boxes. 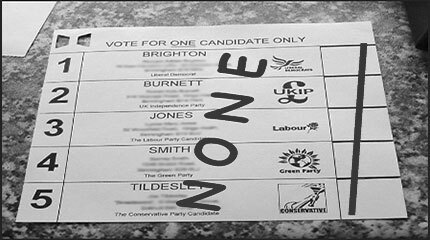 Write NONE across the ballot paper, so that your intention is clear beyond dispute. It will then be indefensible to classify it as 'voter's intention uncertain'. One third of all registered voters didn't vote last time. There are potential protest voters everywhere around you. Help to convince everyone to use their vote: either to Vote, or Vote NONE. There's no reason to be silent. Put up posters, hand out leaflets in busy places, and send tweets to engage non-voters everywhere. Share and like these pages. See the red action box and Why Vote? >> in close results around the country, the media, the public and the parties will demand to know why so many more votes were rejected. >> to explain it, the returning officers will have to justify their certainty about that uncertainty in the voters intentions(! ), so will have to identify them as protest votes. Together we will have improved UK democracy, by estab­lishing a basic democratic way to say 'no' as well as 'yes' to the parties, policies and candidates on offer. We will have laid the foundation for democratic protest in all future elections. Do it! There's no reason to be silent. Protest votes will count if people vote NONE clearly, in numbers that are newsworthy. or vote NONE in protest. Vote for a candidate who you trust, or vote NONE to show that you want better politics. Quote, link and like this site to make sure everyone knows there's no reason to be silent. Discuss ideas and build interest between elections, to keep the pressure on our politicians to do better. And of course… do your bit to build a world you can believe in, through what you do and buy, and the projects you support, as well as how you vote. We all have to register individually. If you have changed address, changed your name, or are away at college or uni­versity, you need to re-register. in the first 7 days of the month. ● Over 20k Facebook Likes for just this page. ● Over 142k separate visits in six weeks. ● Over 46k separate visits just on election day. Don't be silent. Improve UK politics. These posters are party-neutral. They need to go everywhere! Image of Electoral Commission booklet. Can you be impartial, respect voter confidentiality, and follow the UK Code of Practice for Electoral Observers? If so, apply to become an Electoral Observer, and observe the number of votes and protest votes in your constituency. Apply to the UK Electoral Commission by email now, well before 26th May, with form, photo and ID copy. Please email to tell us the constituency you will observe. The definitive election results for each constituency in 2015 from The British Election Study available as an Excel file, including 97,870 'Rejected votes'. Election results from the Electoral Commission. Select 'Electoral data (XLS) files for each UK national or local election. Why Vote? Why Vote NONE? The Electoral Commission have guidelines to assist Returning Officers (respon­sible for counting votes). The full booklet: "Dealing with doubtful ballot papers" can be downloaded here. There is also a visual summary on a place mat, with examples of allowed and disallowed votes. Image of summary place mat. © VoteNone.org.uk 2015-17. The website is offered in good faith, with no guarantees and no liability accepted for its interpretation, use or any consequences thereof. 2017 UK election dates: Local elections: Thursday 4 May. General election: Thursday 8 June. Polling is open 7am to 10pm.